Complete Set! Top sheet (66 in. x 96 in. ), Fitted bottom sheet (39 in. x 75 in.) and one matching pillowcase. Bottom Sheet is fitted with elastic for all around proper fit. Deep Pocket Sheets will fit up to 15 in. thick mattress. 100% Egyptian Cotton grown in and knitted in Egypt. Machine wash in cold water, no bleach, tumble dry low at low temperature. Not all color swatches are available. 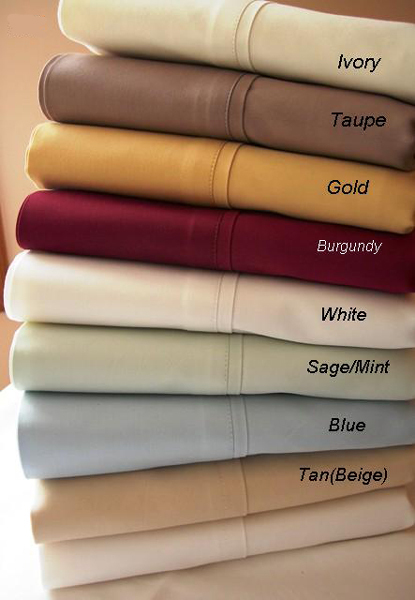 Twin size 300 count thread 100% Egyptian Cotton sheet set with optional mattress pad and protector.